Okay, it isn't exactly a peek at the mess on my desk, but it is in my scrap space, and I'm far more excited to share this with you than anything else right now. First, my computer and printer are two floors up from my basement scrap room, so no more running back and forth just to produce some simple journaling strips. Being able to stay put in my scrap room helps keep the creative juices flowing. "What's On Your Workday Wednesday" is a weekly event where over one hundred crafters show and tell what's going on in their corners of the world. You can go to Julia's blog for more glimpses of our creative endeavors. Ohh I love the sneak peaks. I have a typewriter at mums will have to get it out!! 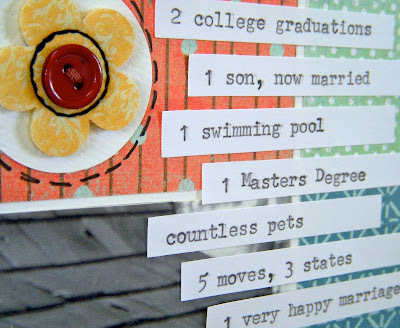 Very cool find - and those journaling strips on your layout are fabulous. I can see how this would save you a ton of time. But!! Now, look what you have done. You are making me pine for an old Selectric typewriter - how cool if I could find one of those - because you can change the font out by changing the metal type ball. Hmmm . . .
Oohhh it does look super cool. I really love how the letters line up. What fun. Oh this awesome! What a great look!!! I love it! 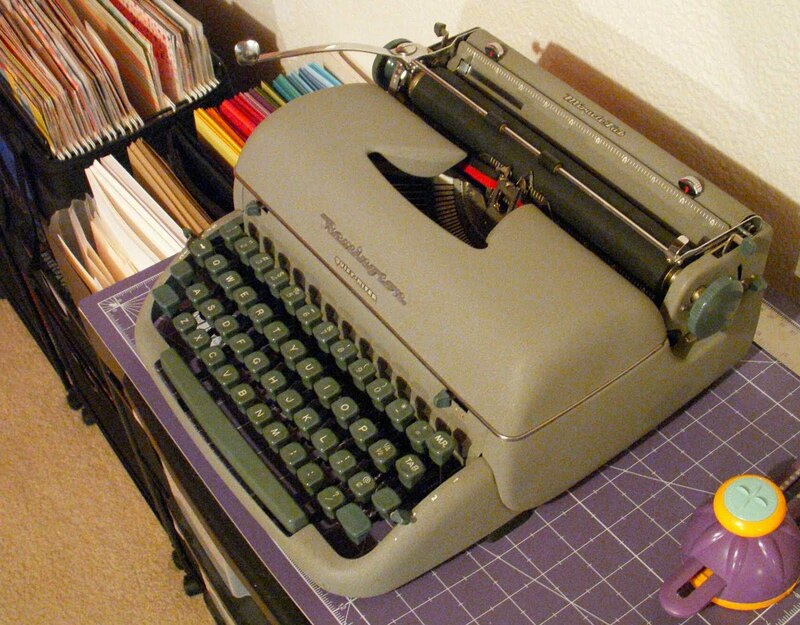 It's very like the typewriter I used to "borrow" from my Dad when I was little. For ages now I have been thinking about going up into my Mum's attic to see if I can find it. Have fun typing! Oh, awesome -- welcome to the world of typewriter joy! You know I love mine. I think the raised caps give your typing a distinctive look -- a font wouldn't be like that, you know? Congrats on the find! I LOVE THIS!!!!! I think you should definitely keep it the way it is, the elevated caps just adds to its vintage charm! Now I want one! 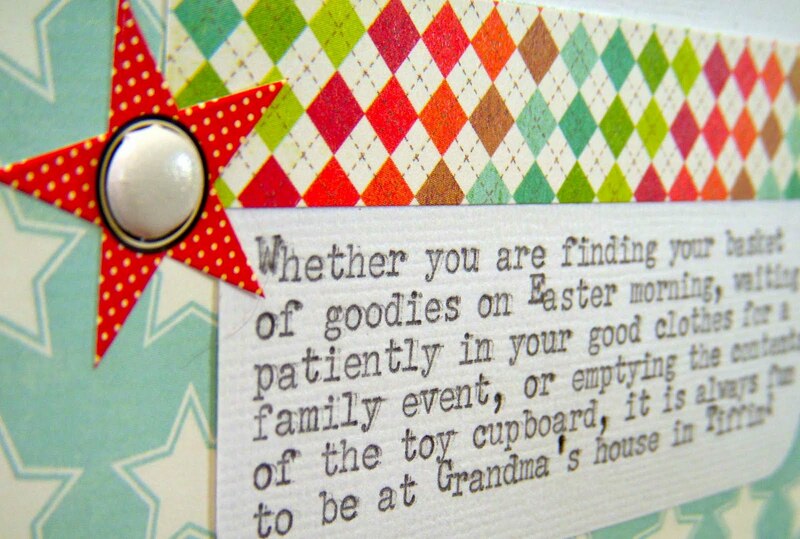 Just one question, what do you do when you run out of ribbon? Great find - I have one too and love it - use it all the time, it adds such a nice touch. Hope you will call by Friday for the first My Mojo Monthly. Thanks for sharing today. That is such a great find and it reminded me that I have my mothers old typewriter in a cupboard somewhere. I am going hunting right now! What a fun find (brings back memories) WP are useful but they cannot replicate the good old fashioned typwriter text and so tactile too. Love the way that looks. Beautiful! Eeeekkkk, I love it. What a great find !!!!! Love this! I may need a typewriter now! And I kinda like the slightly elevated Caps... gives it a lil pizzazz! Those sneaks looks good and a what a fab typewriter! Let it be. a definite case of 'even if it is broken don't fix it'. It's called character. Congrats on your great find! And I agree with everyone else...keep the elevated caps! Wow! What an awesome find...and it works! Isn't it sooooooooooo exciting when you come across something as neat as this and to be able to use it with something that you love doing! Sue - this is an awesome find! I am looking for one too!!! hooo that does look super cool,but in case you go back to printing it all out on your computer, I know of an old typewriting font!! Thank you for the snoop!! have a great day HaPpY WoYwW! I used to have an old Imperial typewriter, on which I typed my college thesis many moons ago. I would leave those misplaced capitals alone - for the purpose of crafting they add character. I'm jealous and happy for you. I would love to have an old typewriter.